The SVG user agent negotiates with its parent user agent to determine the viewport into which the SVG user agent can render the document. In some circumstances, SVG content will be embedded in or referenced by a containing document. This containing document might include attributes, properties and/or other parameters (explicit or implicit) which specify or provide hints about the dimensions of the viewport for the SVG content. SVG content itself optionally can provide information about the appropriate viewport region for the content via the width and height XML attributes on the outermost 'svg' element. The negotiation process uses any information provided by the containing document and the SVG content itself to choose the viewport location and size. When the SVG content is a separately stored resource that is embedded by reference, such as the use of the 'object' element in [XHTML], and the referencing document is styled using CSS [CSS2] or XSL [XSL], and if there are CSS-compatible positioning properties [CSS2-POSN] specified on the referencing element (e.g., the 'object' element) that are sufficient to establish the width of the viewport, then these positioning properties establish the viewport's width; otherwise, the intrinsic width of the SVG content as specified by the the width attribute on the outermost 'svg' element establishes the viewport's width. 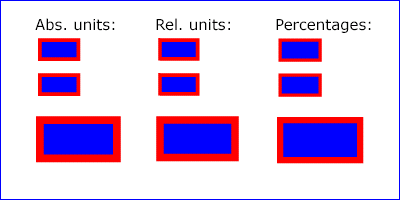 Similarly, if there are positioning properties [CSS2-POSN] specified on the referencing element that are sufficient to establish the height of the viewport, then these positioning properties establish the viewport's height; otherwise, the height attribute on the outermost 'svg' element establishes the viewport's height. 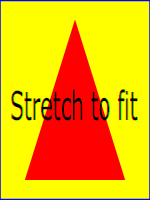 When the SVG content is embedded inline within a containing document, and that document is styled using CSS [CSS2] or XSL [XSL], then if there are CSS-compatible positioning properties [CSS2-POSN] specified on the outermost 'svg' element that are sufficient to establish the width of the viewport, then these positioning properties establish the viewport's width; otherwise, the width attribute on the outermost 'svg' element establishes the viewport's width. 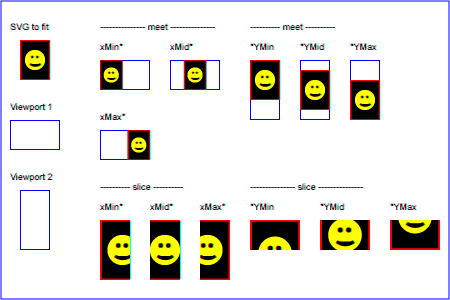 Similarly, if there are positioning properties [CSS2-POSN] specified on the outermost 'svg' element that are sufficient to establish the height of the viewport, then these positioning properties establish the viewport's height; otherwise, the height attribute on the outermost 'svg' element establishes the viewport's height. For the outermost 'svg' element, the SVG user agent determines an initial viewport coordinate system and an initial user coordinate system such that the two coordinates systems are identical. The origin of both coordinate systems is at the origin of the viewport, and one unit in the initial coordinate system equals one "pixel" (i.e., a px unit as defined in [CSS2 lengths]) in the viewport. In most cases, such as stand-alone SVG documents or SVG document fragments embedded within XML parent documents where the parent's layout is determined by CSS [CSS2] or XSL [XSL], the initial viewport coordinate system (and therefore the initial user coordinate system) has its origin at the top/left of the viewport, with the positive x-axis pointing towards the right, the positive y-axis pointing down, and text rendered with an "upright" orientation, which means glyphs are oriented such that Roman characters and full-size ideographic characters for Asian scripts have the top edge of the corresponding glyphs oriented upwards and the right edge of the corresponding glyphs oriented to the right. At any point in an SVG drawing, you can establish a new viewport into which all contained graphics is drawn by including an 'svg' element inside SVG content. By establishing a new viewport, you also implicitly establish a new viewport coordinate system, a new user coordinate system and, potentially, a new clipping path. When percentages are used with attributes that define the gradient vector, the pattern tile, the filter region or the masking region, a percentage represents the same value as the corresponding decimal value (e.g., 50% means the same as 0.5). 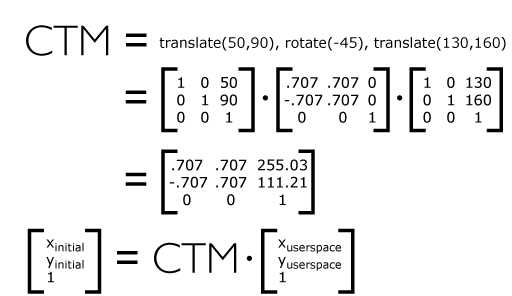 If pecentages are used within the content of a 'pattern', 'clipPath', 'mask' or 'filter' element, these values are treated according to the processing rules for percentages as defined in Units. For SVG_TRANSFORM_TRANSLATE, e and f represents the translation amounts (a=1,b=0,c=0,d=1). For SVG_TRANSFORM_SCALE, a and d represents the scale amounts (b=0,c=0,e=0,f=0).